But it was a good thing. The doctor was listening to Floyd’s carotid arteries, the two major blood vessels that supply oxygenated blood to the brain. The doctor did not like what he heard. Following a sonogram of the carotid arteries, Larry Kraiss, MD, chief of Vascular Surgery Clinic at University of Utah Health had to deliver the difficult news. Both of Floyd’s carotid arteries were clogged — 70 percent clogged. A further MRI and a brain scan revealed dark spots — portions of Floyd’s brain tissue had died during small strokes. The doctor’s presented Floyd with an opportunity — participation in the CREST-2 clinical trial to help himself as well as other potential stroke patients in his home state of Utah and across the nation. CREST-2 is one of a series of trials managed by StrokeNet, a clinical trials network funded through the National Institutes of Health to advance the study of stroke treatment, prevention, and recovery available to patients across the country. “StrokeNet allows us to bring clinical trials to the people rather than the people to the trials,” said Jennifer Majersik, MD, associate professor of Neurology at U of U Health and principle investigator for the Utah StrokeNet regional center. Utah StrokeNet coordinates clinical trials conducted at nine stroke centers in three states across the Mountain West. These trials are vital to improve prevention and treatments, but Majersik sees the stress that stroke patients and their caregivers experience when they arrive at the emergency room. When a stroke happens, a patient has about a three-hour window to receive care. In this compressed timeframe, doctors have to rapidly explain the ins and outs of a clinical trial to eligible patients, a requirement when enrolling in a study. 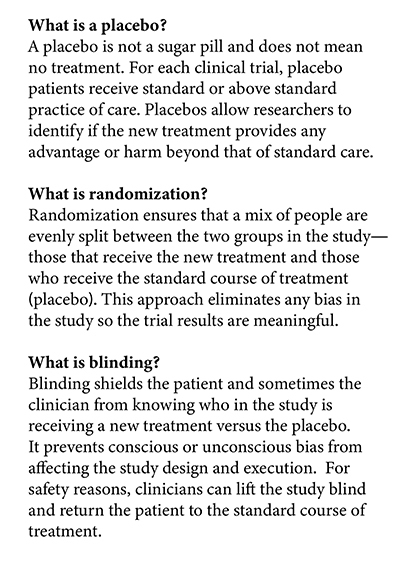 She wants to provide potential patients, family, caregivers, and surrogates a better understanding of the key points of clinical trials, like placebo, randomization, and blinding. A basic understanding of this information will reduce the burden of information overload on patients and their family when they arrive at the hospital during a time of crisis. When considering joining the clinical trial, Floyd had an advantage over other StrokeNet patients. He had not yet experienced the catastrophic event that could debilitate and even kill. He had time — time to implement changes that could extend his life. Floyd thought over his options and decided to take his care team’s recommendation, joining CREST-2 in July 2015. CREST-2 focuses on patients whose carotid artery narrows as plaque deposits accumulate. Patients are left susceptible to strokes and temporary strokes (transient ischemic attack), which can cause paralysis, numbness, vision loss, or inability to speak. Patients enrolled in CREST-2 are randomly assigned to one of three groups to compare treatments for management of stroke prevention. The non-intervention group (placebo) receives standard treatment, consisting of medications to reduce blood clots, lower blood pressure, and reduce bad cholesterol. They also work with a life coach to learn new ways to incorporate a healthy lifestyle into their daily activities, a benefit generally not available to most stroke patients. The other two groups receive the same care as the non-intervention group as well as have their carotid artery opened by either surgical removal of plaque or carotid stenting. CREST-2 is currently enrolling participants at multiple hospitals in Utah and is seeking patients who are 35 years or older, have a narrowing of the carotid artery (by 70 percent), and lack other serious medical complications. For information on how to become a participant as well as trial details, contact the UT StrokeNet at 801-581-5523. Floyd was selected for the non-intervention group. 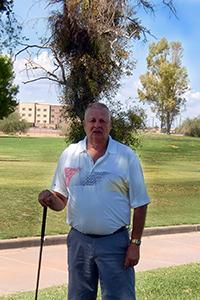 After two years taking the prescribed medications and maintaining a healthy lifestyle, his right carotid artery had not stabilized. His care team decided it was time to surgically clean the plaque from his right artery. Today, his right carotid artery has minimal blockage and his left artery remains stable. How does Floyd feel about being a medical pioneer? 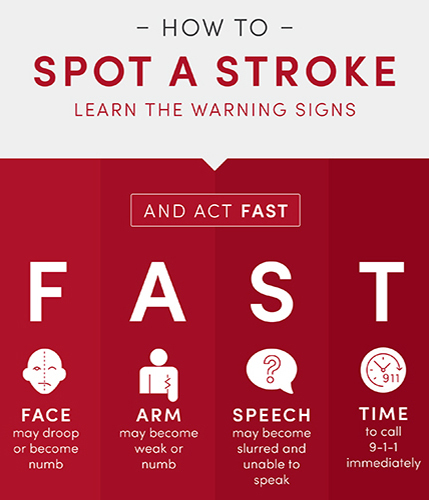 At the first sign of stroke, remember to act FAST. According to Majersik, you can make a difference by simply understanding the symptoms of stroke and knowing how to respond. At the first sign of stroke, remember to act FAST. T – Time to call. A healthy lifestyle can also be one of the best lines of defense against stroke. "Not only is high blood pressure one of the leading risk factors for stroke, but it is also one of the most controllable risk factors, as well," said Majersik.